Leander Star is the horn player with the City of Tomorrow, the only wind quintet to have won the gold medal at the Fischoff National Chamber Music Competition in over ten years and the recipients of a 2014 Chamber Music America Classical Commissioning Grant. The quintet was formed in 2010 and has since become known for their performances of virtuosic works, including the North American premiere of “Blow” by Franco Donatoni in 2010 and world premieres of works by Rob Keeley (2012), Zosha Di Castri (2012), and Nat Evans (2014). Leander also holds positions with the Oregon Ballet Theater Orchestra and the Portland Opera Orchestra. As well as his current work with the City of Tomorrow and orchestras in Portland, Oregon, Leander Star has performed with the Civic Orchestra of Chicago under Maestros Riccardo Muti and Esa Pekka Salonen, Gruppo Montebello (the faculty chamber orchestra at the Banff Centre for the Arts in Alberta, Canada), Fear No Music (Portland, Oregon), and the Friends of Rain Ensemble (the faculty new music ensemble at Lewis and Clark College.) He plays regularly with the IRIS Orchestra in Memphis, Tennessee and the Memphis Symphony Orchestra. 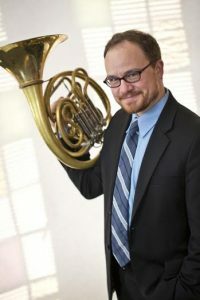 In addition to teaching horn at the University of Mississippi at Oxford, Leander is the horn instructor at Rhodes College in Memphis, Tennessee. In 2013, he joined the faculty of Young Musicians and Artists, Oregon’s premier summer residential arts program since 1965. Leander holds degrees in horn performance and literature from Northwestern University and the San Francisco Conservatory of Music. His primary teachers include Gail Williams, William Barnewitz, Jonathan Ring, Robert Ward, and William Stalnaker.